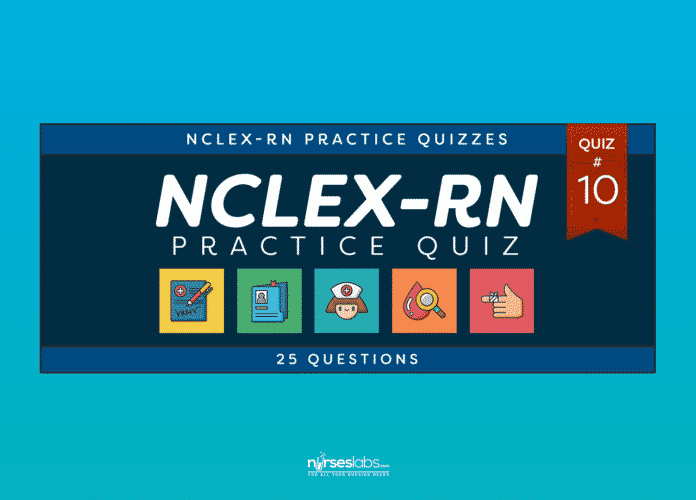 This 20-item questionnaire for the NCLEX, includes topics about cardiovascular diseases and cancer. Pain is temporary. It may last a minute, or an hour, or a day, or a year, but eventually it will subside and something else will take its place. If I quit, however, it lasts forever. That surrender, even the smallest act of giving up, stays with me. So when I feel like quitting, I ask myself, which would I rather live with? Questions on this exam are taken from random various nursing concepts. Read each question carefully and choose the best answer. You are given one minute per question. Spend your time wisely! Answers and rationales are given below. Be sure to read them. If you need more clarifications, please direct them to the comments section. In Exam Mode: All questions are shown but the results, answers, and rationales (if any) will only be given after you’ve finished the quiz. You are given 1 minute per question, a total of 20 minutes for this quiz. A patient arrives at the emergency department complaining of midsternal chest pain. Which of the following nursing action should take priority? A complete history with emphasis on preceding events. Careful assessment of vital signs. The priority nursing action for a patient arriving at the ED in distress is always assessment of vital signs. This indicates the extent of physical compromise and provides a baseline by which to plan further assessment and treatment. A thorough medical history, including onset of symptoms, will be necessary and it is likely that an electrocardiogram will be performed as well, but these are not the first priority. Similarly, chest exam with auscultation may offer useful information after vital signs are assessed. A patient has been hospitalized with pneumonia and is about to be discharged. A nurse provides discharge instructions to a patient and his family. Which misunderstanding by the family indicates the need for more detailed information? The patient may resume normal home activities as tolerated but should avoid physical exertion and get adequate rest. The patient should resume a normal diet with emphasis on nutritious, healthy foods. The patient may discontinue the prescribed course of oral antibiotics once the symptoms have completely resolved. The patient should continue use of the incentive spirometer to keep airways open and free of secretions. even after symptoms have resolved to prevent incomplete eradication of the organism and recurrence of infection. The patient should resume normal activities as tolerated, as well as a nutritious diet. Continued use of the incentive spirometer after discharge will speed recovery and improve lung function. A nurse is caring for an elderly Vietnamese patient in the terminal stages of lung cancer. Many family members are in the room around the clock performing unusual rituals and bringing ethnic foods. Which of the following actions should the nurse take? Restrict visiting hours and ask the family to limit visitors to two at a time. Notify visitors with a sign on the door that the patient is limited to clear fluids only with no solid food allowed. If possible, keep the other bed in the room unassigned to provide privacy and comfort to the family. Contact the physician to report the unusual rituals and activities. When a family member is dying, it is most helpful for nursing staff to provide a culturally sensitive environment to the degree possible within the hospital routine. In the Vietnamese culture, it is important that the dying be surrounded by loved ones and not left alone. Traditional rituals and foods are thought to ease the transition to the next life. When possible, allowing the family privacy for this traditional behavior is best for them and the patient. Answers A, B, and D are incorrect because they create unnecessary conflict with the patient and family. The charge nurse on the cardiac unit is planning assignments for the day. Which of the following is the most appropriate assignment for the float nurse that has been reassigned from labor and delivery? A one-week postoperative coronary bypass patient, who is being evaluated for placement of a pacemaker prior to discharge. A suspected myocardial infarction patient on telemetry, just admitted from the Emergency Department and scheduled for an angiogram. A patient with unstable angina being closely monitored for pain and medication titration. A postoperative valve replacement patient who was recently admitted to the unit because all surgical beds were filled. The charge nurse planning assignments must consider the skills of the staff and the needs of the patients. The labor and delivery nurse who is not experienced with the needs of cardiac patients should be assigned to those with the least acute needs. The patient who is one-week post-operative and nearing discharge is likely to require routine care. A new patient admitted with suspected MI and scheduled for angiography would require continuous assessment as well as coordination of care that is best carried out by experienced staff. The unstable patient requires staff that can immediately identify symptoms and respond appropriately. A postoperative patient also requires close monitoring and cardiac experience. A newly diagnosed 8-year-old child with type I diabetes mellitus and his mother are receiving diabetes education prior to discharge. The physician has prescribed Glucagon for emergency use. The mother asks the purpose of this medication. Which of the following statements by the nurse is correct? Glucagon enhances the effect of insulin in case the blood sugar remains high one hour after injection. Glucagon treats hypoglycemia resulting from insulin overdose. Glucagon treats lipoatrophy from insulin injections. Glucagon prolongs the effect of insulin, allowing fewer injections. Glucagon is given to treat insulin overdose in an unresponsive patient. Following Glucagon administration, the patient should respond within 15-20 minutes at which time oral carbohydrates should be given. Glucagon reverses rather than enhances or prolongs the effects of insulin. Lipoatrophy refers to the effect of repeated insulin injections on subcutaneous fat. An infant with congestive heart failure is receiving diuretic therapy at home. Which of the following symptoms would indicate that the dosage may need to be increased? Weight gain is an early symptom of congestive heart failure due to accumulation of fluid. When diuretic therapy is inadequate, one would expect an increase in blood pressure, tachypnea, and tachycardia to result. A patient taking Dilantin (phenytoin) for a seizure disorder is experiencing breakthrough seizures. A blood sample is taken to determine the serum drug level. Which of the following would indicate a sub-therapeutic level? The therapeutic serum level for Dilantin is 10 – 20 mcg/mL. A level of 4 mcg/mL is subtherapeutic and may be caused by patient non-compliance or increased metabolism of the drug. A level of 15 mcg/mL is therapeutic. Choices C and D are expressed in mcg/dL, which is the incorrect unit of measurement. A patient arrives at the emergency department complaining of back pain. He reports taking at least 3 acetaminophen tablets every three hours for the past week without relief. Which of the following symptoms suggests acetaminophen toxicity? Acetaminophen in even moderately large doses can cause serious liver damage that may result in death. Immediate evaluation of liver function is indicated with consideration of N-acetylcysteine administration as an antidote. Tinnitus is associated with aspirin overdose, not acetaminophen. Diarrhea and hypertension are not associated with acetaminophen. A nurse is caring for a cancer patient receiving subcutaneous morphine sulfate for pain. Which of the following nursing actions is most important in the care of this patient? Morphine sulfate can suppress respiration and respiratory reflexes, such as cough. Patients should be monitored regularly for these effects to avoid respiratory compromise. Morphine sulfate does not significantly affect urine output, heart rate, or body temperature. A patient arrives at the emergency department with severe lower leg pain after a fall in a touch football game. Following routine triage, which of the following is the appropriate next step in assessment and treatment? Apply heat to the painful area. Apply an elastic bandage to the leg. Following triage, an x-ray should be performed to rule out fracture. Ice, not heat, should be applied to a recent sports injury. An elastic bandage may be applied and pain medication given once fracture has been excluded. A nurse caring for several patients on the cardiac unit is told that one is scheduled for implantation of an automatic internal cardioverter-defibrillator. Which of the following patients is most likely to have this procedure? A patient admitted for myocardial infarction without cardiac muscle damage. A post-operative coronary bypass patient, recovering on schedule. A patient with a history of ventricular tachycardia and syncopal episodes. A patient with a history of atrial tachycardia and fatigue. An automatic internal cardioverter-defibrillator delivers an electric shock to the heart to terminate episodes of ventricular tachycardia and ventricular fibrillation. This is necessary in a patient with significant ventricular symptoms, such as tachycardia resulting in syncope. A patient with myocardial infarction that resolved with no permanent cardiac damage would not be a candidate. A patient recovering well from coronary bypass would not need the device. Atrial tachycardia is less serious and is treated conservatively with medication and cardioversion as a last resort. The patient takes antipsychotic medication. A nurse calls a physician with the concern that a patient has developed a pulmonary embolism. Which of the following symptoms has the nurse most likely observed? The patient is somnolent with decreased response to the family. The patient suddenly complains of chest pain and shortness of breath. The patient has developed a wet cough and the nurse hears crackles on auscultation of the lungs. The patient has a fever, chills, and loss of appetite. Typical symptoms of pulmonary embolism include chest pain, shortness of breath, and severe anxiety. The physician should be notified immediately. A patient with pulmonary embolism will not be sleepy or have a cough with crackles on exam. A patient with fever, chills and loss of appetite may be developing pneumonia. A patient comes to the emergency department with abdominal pain. Work-up reveals the presence of a rapidly enlarging abdominal aortic aneurysm. Which of the following actions should the nurse expect? The patient will be admitted to the medicine unit for observation and medication. The patient will be admitted to the day surgery unit for sclerotherapy. The patient will be admitted to the surgical unit and resection will be scheduled. The patient will be discharged home to follow-up with his cardiologist in 24 hours. A rapidly enlarging abdominal aortic aneurysm is at significant risk of rupture and should be resected as soon as possible. No other appropriate treatment options currently exist. A patient is admitted to the oncology unit for diagnosis of suspected Hodgkin’s disease. Which of the following symptoms is typical of Hodgkin’s disease? Symptoms of Hodgkin’s disease include night sweats, fatigue, weakness, and tachycardia. The disease is characterized by painless, enlarged cervical lymph nodes. Weight loss occurs early in the disease. Nausea and vomiting are not typically symptoms of Hodgkin’s disease. The Hodgkin’s disease patient described in the question above undergoes a lymph node biopsy for definitive diagnosis. If the diagnosis of Hodgkin’s disease were correct, which of the following cells would the pathologist expect to find? A definitive diagnosis of Hodgkin’s disease is made if Reed-Sternberg cells are found on pathologic examination of the excised lymph node. Lymphoblasts are immature cells found in the bone marrow of patients with acute lymphoblastic leukemia. Gaucher’s cells are large storage cells found in patients with Gaucher’s disease. Rieder’s cells are myeloblasts found in patients with acute myelogenous leukemia. A patient is about to undergo bone marrow aspiration and biopsy and expresses fear and anxiety about the procedure. Which of the following is the most effective nursing response? Warn the patient to stay very still because the smallest movement will increase her pain. Encourage the family to stay in the room for the procedure. Stay with the patient and focus on slow, deep breathing for relaxation. Delay the procedure to allow the patient to deal with her feelings. Slow, deep breathing is the most effective method of reducing anxiety and stress. It reduces the level of carbon dioxide in the brain to increase calm and relaxation. Warning the patient to remain still will likely increase her anxiety. Encouraging family members to stay with the patient may make her worry about their anxiety as well as her own. Delaying the procedure is unlikely to allay her fears. In Text Mode: All questions and answers are given for reading and answering at your own pace. You can also copy this exam and make a print out. 1. A patient arrives at the emergency department complaining of midsternal chest pain. Which of the following nursing action should take priority? A. A complete history with emphasis on preceding events. C. Careful assessment of vital signs. D. Chest exam with auscultation. 2. A patient has been hospitalized with pneumonia and is about to be discharged. A nurse provides discharge instructions to a patient and his family. Which misunderstanding by the family indicates the need for more detailed information? A. The patient may resume normal home activities as tolerated but should avoid physical exertion and get adequate rest. B. The patient should resume a normal diet with emphasis on nutritious, healthy foods. C. The patient may discontinue the prescribed course of oral antibiotics once the symptoms have completely resolved. D. The patient should continue use of the incentive spirometer to keep airways open and free of secretions. 3. A nurse is caring for an elderly Vietnamese patient in the terminal stages of lung cancer. Many family members are in the room around the clock performing unusual rituals and bringing ethnic foods. Which of the following actions should the nurse take? A. Restrict visiting hours and ask the family to limit visitors to two at a time. B. Notify visitors with a sign on the door that the patient is limited to clear fluids only with no solid food allowed. C. If possible, keep the other bed in the room unassigned to provide privacy and comfort to the family. D. Contact the physician to report the unusual rituals and activities. 4. The charge nurse on the cardiac unit is planning assignments for the day. Which of the following is the most appropriate assignment for the float nurse that has been reassigned from labor and delivery? A. A one-week postoperative coronary bypass patient, who is being evaluated for placement of a pacemaker prior to discharge. B. A suspected myocardial infarction patient on telemetry, just admitted from the Emergency Department and scheduled for an angiogram. C. A patient with unstable angina being closely monitored for pain and medication titration. D. A postoperative valve replacement patient who was recently admitted to the unit because all surgical beds were filled. 5. A newly diagnosed 8-year-old child with type I diabetes mellitus and his mother are receiving diabetes education prior to discharge. The physician has prescribed Glucagon for emergency use. The mother asks the purpose of this medication. Which of the following statements by the nurse is correct? A. Glucagon enhances the effect of insulin in case the blood sugar remains high one hour after injection. B. Glucagon treats hypoglycemia resulting from insulin overdose. C. Glucagon treats lipoatrophy from insulin injections. D. Glucagon prolongs the effect of insulin, allowing fewer injections. 6. An infant with congestive heart failure is receiving diuretic therapy at home. Which of the following symptoms would indicate that the dosage may need to be increased? 7. A patient taking Dilantin (phenytoin) for a seizure disorder is experiencing breakthrough seizures. A blood sample is taken to determine the serum drug level. Which of the following would indicate a sub-therapeutic level? 8. A patient arrives at the emergency department complaining of back pain. He reports taking at least 3 acetaminophen tablets every three hours for the past week without relief. Which of the following symptoms suggests acetaminophen toxicity? 9. A nurse is caring for a cancer patient receiving subcutaneous morphine sulfate for pain. Which of the following nursing actions is most important in the care of this patient? 10. A patient arrives at the emergency department with severe lower leg pain after a fall in a touch football game. Following routine triage, which of the following is the appropriate next step in assessment and treatment? A. Apply heat to the painful area. B. Apply an elastic bandage to the leg. D. The patient takes antipsychotic medication. C. The patient has developed a wet cough and the nurse hears crackles on auscultation of the lungs. 16. A patient is undergoing the induction stage of treatment for leukemia. The nurse teaches family members about infectious precautions. Which of the following statements by family members indicates that the family needs more education? A. We will bring in books and magazines for entertainment. B. We will bring in personal care items for comfort. C. We will bring in fresh flowers to brighten the room. D. We will bring in family pictures and get well cards. 17. A nurse is caring for a patient with acute lymphoblastic leukemia (ALL). Which of the following is the most likely age range of the patient? 18. A patient is admitted to the oncology unit for diagnosis of suspected Hodgkin’s disease. Which of the following symptoms is typical of Hodgkin’s disease? A. Painful cervical lymph nodes. B. Night sweats and fatigue. 19. The Hodgkin’s disease patient described in the question above undergoes a lymph node biopsy for definitive diagnosis. If the diagnosis of Hodgkin’s disease were correct, which of the following cells would the pathologist expect to find? 20. A patient is about to undergo bone marrow aspiration and biopsy and expresses fear and anxiety about the procedure. Which of the following is the most effective nursing response? A. Warn the patient to stay very still because the smallest movement will increase her pain. B. Encourage the family to stay in the room for the procedure. C. Stay with the patient and focus on slow, deep breathing for relaxation. D. Delay the procedure to allow the patient to deal with her feelings. 1. Answer: C. Careful assessment of vital signs. 2. Answer: C. The patient may discontinue the prescribed course of oral antibiotics once the symptoms have completely resolved. It is always critical that patients being discharged from the hospital take prescribed medications as instructed. In the case of antibiotics, a full course must be completed even after symptoms have resolved to prevent incomplete eradication of the organism and recurrence of infection. The patient should resume normal activities as tolerated, as well as a nutritious diet. Continued use of the incentive spirometer after discharge will speed recovery and improve lung function. 3. Answer: C. If possible, keep the other bed in the room unassigned to provide privacy and comfort to the family. 4. Answer: A. A one-week postoperative coronary bypass patient, who is being evaluated for placement of a pacemaker prior to discharge. 5. Answer: B. Glucagon treats hypoglycemia resulting from insulin overdose. 6. Answer: A. Sudden weight gain. 7. Answer: B. 4 mcg/mL. 8. Answer: D. Hepatic damage. 9. Answer: B. Monitor respiratory rate. 10. Answer: C. X-ray the leg. 11. Answer: C. A patient with a history of ventricular tachycardia and syncopal episodes. 12. Answer: B. The patient has a pacemaker. 13. Answer: B. The patient suddenly complains of chest pain and shortness of breath. 14. Answer: C. The patient will be admitted to the surgical unit and resection will be scheduled. 15. Answer: D. Check for signs of bleeding, including examination of urine and stool for blood. 16. Answer: C. We will bring in fresh flowers to brighten the room. 17. Answer: A. 3-10 years. 18. Answer: B. Night sweats and fatigue. 19. Answer: A. Reed-Sternberg cells. 20. Answer: C. Stay with the patient and focus on slow, deep breathing for relaxation. 3,500+ NCLEX-RN Practice Questions for Free – Tons of practice questions for various topics in the NCLEX-RN!